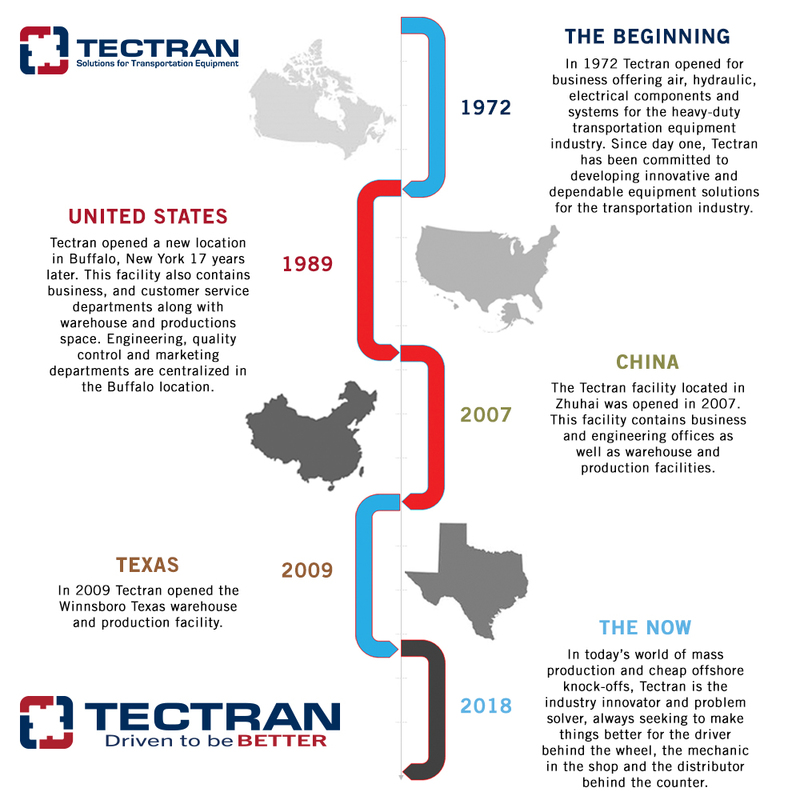 Over a period of 40+ years, Tectran has become a manufacturer and marketer of air, hydraulic and electrical components and systems for the transportation equipment industry. Our primary market focus includes the heavy truck, trailer and bus industries though our continuous product line expansion has begun to draw us into other mobile equipment markets. Our primary mission is to supply products that offer maintenance, operating, security and safety solutions to equipment operators and to make these readily available on new equipment and for service needs through an extensive network of professional parts marketers across the continent. Our active participation in the industry’s major technical specification groups and our commitment to quality and durability assure leading edge product designs and superior performance for demanding market applications. We hold several patents and make it a practice to listen closely to the needs of the end user. While we’re best known for our innovative tractor-trailer hook-up lines, Tectran offers a wide range of products enabling “one-stop” purchasing. In addition to our own unique items, we provide extensive interchanges to popular market brands and are constantly broadening our product offering and working with supplier partners to provide added convenience to our customers. The trucking industry is one of the biggest and most important contributors to the U.S. economy. Over 10.5 billion tons of freight is moved on trucks annually. The industry employs nearly 3.5 million professional drivers and when non-drivers are added to the mix, the total number exceeds 8.7 million. In other words, about one in every 15 workers in the U.S. is employed in the trucking business. To the men and women who make their living in this industry, success can sometimes come down to the performance of a small part. A hose cracks, a control box fails, a pressure gauge gives a false reading and an important shipment is late. Or damaged. Or lost. Every trucker knows that quality parts make a big difference. Tectran knows this too. For over 40 years, Tectran has served the heavy truck and trailer industry as a designer, manufacturer and marketer of air, hydraulic and electrical components and systems. Selling through an extensive network of professional parts marketers, Tectran produces high quality, U.S. made products that offer maintenance, operating, safety, and security solutions to equipment operators throughout the U.S. and Canada. Quite simply, we keep America’s trucks moving. Trucking is a serious business. Wrangling a 500 horse power, quarter of a million-dollar tractor rig from point A to point B with a full load is not a job for the faint of heart. The hours are long, deadlines are tight, and the work is often dirty and dangerous. It doesn’t matter whether you drive on a rural stretch of highway or a crowded expressway at rush hour, the performance of the smallest part matters. Simply put, better parts make a difference. We make better parts because we know lives may depend on them. A cracked hose or bad connector can quickly turn a tractor-trailer into a 40-ton missile. It’s why we design, test and manufacture every Tectran part with safety and performance in mind. We make better parts because each and every delivery is important to someone. Downtime due to parts failure can delay a delivery of needed parts for a manufacturing line or medicine for a critically ill patient. Failure is simply not an option. We make better parts because the job is already tough enough. Choosing the right OEM or replacement parts shouldn’t make life more complicated. Better parts make it easier to spec and stock with the confidence that every item will help your customers go the distance. At Tectran, making good parts is simply not good enough, so we are committed to making our parts better. At our core, we’re problem solvers. No matter how good something is, it can always be better. We never stop trying to improve ways to design, produce and distribute our products. Innovation is in our DNA. For some manufacturer’s ‘quality’ is just ad-speak. For us, quality means that good is never good enough. We constantly strive to design and manufacture the highest quality products possible. And then we try to make them better. Our success depends not just on our products, but on the relationships, we have with the people throughout the sales and supply chain. We listen to our customers so that we can better understand and meet their needs. We design and manufacture all of our products with user safety in mind. The men and women who rely on Tectran products to do their job better can feel secure knowing that their equipment will perform every day. We design and build our products to be best-in class. We don’t make false performance claims because we don’t need to. We proudly stand behind every product we make. It’s just a better way of doing business. We’re talking to the drivers who make their living on the road… who know that failure of even the smallest part can delay an important delivery, not to mention have serious safety consequences. They need to be confident that their equipment is the best available, so they can stay focused on the road. We’re talking to the mechanics who are responsible for keeping those truckers on the move. They know their work is only as good as the parts they use and they don’t have time to waste on poorly made, offshore parts that may not go the distance. We’re talking to the parts guys who stock thousands of parts so their customers have what they need when they need it. Quality, compatibility and partnership are a must in order to manage inventory and keep customers happy. We’re talking to the fleet managers who juggle schedules, inventory and countless other variables every day in order to keep multiple trucks on the move. They know a single part failure means downtime that can throw delivery schedules off for days. We’re talking to the OEMs who balance cost with compatibility and quality to keep the production line running. Finding a partner who cares as much about the details as they do not only makes their job easier, but the bottom line better. We're talking to the people who lead and drive the backbone behind of our Society. TECTRAN is focused on providing solutions for our customers. One of our core abilities is being an advocate for our customers’ needs. We are experts at understanding the dynamics of your application environment, but we also realize that there are many specialized needs. It takes exceptional two-way communication to be able to fully understand the real issue and provide a solution that hits the mark. We rely on your input and participation during the design process from start to finish. Once a need is identified and quantified with you, a solution concept is outlined. The project is then placed into the expert hands of our creative engineers for development. Our Quality Department is also an integral part of this process, ensuring we are building confidence into our solutions from the very beginning. We put all our products through a rigorous field testing program to ensure that performance and reliability specifications meet expectations. Specialized manufacturing equipment and processes are prevalent throughout our network in North America and are a core element of many of the Solutions brought to you by TECTRAN. For example, TECTRAN’S air and electrical coil assemblies exhibit best-in-class coil retention and resistance to sag due to proprietary manufacturing processes and equipment located at our New York and Texas operation centers. TECTRAN is committed to maintaining a vast manufacturing and distribution network so that we can effectively service our customers, no matter where you are. In 2013, our footprint tripled in the Buffalo NY area. We also continue to invest in new manufacturing equipment in Texas and Canada to meet the demands of our customers throughout North America. Whether it’s a critical eye on quality, best-in-class customer service or industry leading sales support, we know that our people are the single biggest influence on how our customers “experience TECTRAN”. Our goal is for you to feel that TECTRAN is an industry leader at interpersonal relationships and communicating with you and your business. We covet strong customer relationships and know they are a key factor in our ability to continuously deliver solutions for your business. TECTRAN is committed to providing our customers with a wide range of products and we’ll go as deep into those categories as you need us to. Didn’t find what you are looking for? Just give us a call at 1-800-776-5549.